Even though more and more people are educated and aware of the benefits of recycling, many recycling centers are closing in the state of California. What should be done about this…or what can be done? In the last 3 years over 800 recycling centers have closed their doors; leaving customers looking for alternatives or possibly not. The recycling rate of beverage containers in California fell below 80 percent, which hasn’t happened since 2008. Other types of recyclable materials also decreased drastically, leading to speculation as to a cause for such a decrease. It has become less expensive to create new products and therefore the use of recycled beverage containers decreased. That combined with more waste being produced overall and recycling incentives decreasing has led to these decreases in rates of recycling. A stark picture of the results of this can be seen when looking at one company, rePlanet, they closed 191 recycling centers and laid off 278 employees in California just last year. Recycling advocates want more government subsidy programs to help these recycling centers out of these difficult times. Many Californians have lost their local recycling center, especially in rural areas as businesses tend to close those first and are keeping centers open in bigger cities. This also hurts those in low income areas who may not have the means to travel to a recycling facility not within walking distance. Getting caught up in bureaucracy is frustrating considering some believe that fixing the issue might not even cost the state more money. Recycling centers are in need of about $50 million to stay open, and CalRecycle currently has $250 million in surplus money, but the funds are not approved for the purpose. The system will continue to collapse unless swift action is taken. And the customers and the environment at large will pay the ultimate price along with the recycling companies and their employees. A lot needs to be done to try and fix the issues modern recycling centers face, but it may have to get some major help from Governor Jerry Brown. There have been some efforts made by Senators, but nothing has gained traction thus far. Hopefully with increased awareness there will be more action taken and soon. Here are some recent tweets related to Local Recycling centers. Taking computer recycling seriously is very important if you want to make your contribution towards a greener planet. There are currently no federal regulations on e-waste recycling, so individual states have to come up with their own regulations. Only about half of the states in the US have so far come up with such regulations. However, regardless of which state you live in, it is a matter of responsibility to find out the available computer recycling options. There are different organizations that have initiated recycling programs across North America. If you check with recyclingcenternear.me you can easily find out the nearest recycling centers or options available for you. 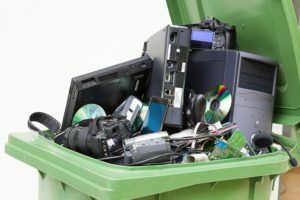 Even some manufacturers of computers and other electronics may have their own programs, or partner with third-party organizations to take back used machines from their customers for recycling. So you should check with your computer manufacturer if they have allowed customers any recycling options. Earth911 partners with Dell among other computer manufacturers as well as organizations involved in more recycling programs across the country. One of their partners, call2recycle.org, is also another leader in the computer recycling sector. They mainly take care of battery recycling and you can check on their website too to find a drop-off location near you. There is a large network of organizations involved in the recycling business and wherever you live should still be able find an option for recycling computers. Throwing away a used computer or any part of the computer to the trash to end up in a landfill is not an option. The circuit boards and other parts often contain toxic materials such as lead, chromium, beryllium, cadmium, mercury, brominated flame retardants and much more. That makes e-waste from computers a great environmental concern. Throwing the e-waste in trash where it mixes with regular waste is a terrible decision. The normal waste management systems that most cities use do not take care of e-waste. When computer parts end up burned, toxic materials like lead, mercury, copper and others leach into the soil and may easily end up in food chains eventually harming humans. Recycling computers yourself may also not be a good idea because proper systems and recycling processes are required to avoid toxic effects. Some people burn parts of computers including PVC materials in order to extract metals like copper. In addition to contaminating the soil, such processes leave people exposed to extremely toxic gases released in the air. With most computer recycling programs, you can actually get paid some cash for your old computers. That depends on whether your old machine still has any useful components that may be of value if reused. Different recycling programs may have their own rules determining when they can pay cash to recycle. Some manufacturers will either pay cash for the old computers they take back or allow trade-ins to benefit their customers. Whichever option best applies to you, getting your old computer junk recycled instead of using valuable space at home or office is definitely a great choice. We live in a wireless world that runs on batteries, most of which contain toxic metals that can be extremely harmful to the environment. Only a very small percentage of alkaline batteries get recycled after use. At least for the car batteries that contain lead and acid, the recycling rate in the US is over 90%. That has been possible because manufacturers of such batteries have initiated the efforts to recycle them. However, for most of the smaller batteries commonly used in households, many efforts in creating awareness for recycling are needed. Don’t just throw away batteries after use Lead, cadmium, mercury, cobalt and other toxic materials contained in different types of batteries should never find their way to the landfills. If that happens, they will cause soil contamination and finally find their way into the water or food that we end up consuming. The toxic effects on humans include diseases like cancer, respiratory and kidney problems. So if you are kind to our planet should never throw batteries into the trash. Your city’s municipal solid waste management processes cannot take care of that. So all the batteries you have used in various devices at home should go to a recycling center near you. There are numerous centers or collection points for battery recycling programs throughout the US. You can call your city to find out where they are located, but checking out online with organizations that champion recycling initiatives could be much easier. You can check with call2recycle.org to find out the nearest drop-off locations. Earth911.com can also similarly help and partners with other organizations involved in various recycling programs. Of course you can also use the Recycling Center Near Me site to locate a battery disposal facility. Manufacturers of lead acid batteries used in most automobiles or for solar energy storage have established their collection points in almost every part of the country. They mostly use car dealers or sellers of such batteries to help them collect all used batteries from customers for recycling. A certain amount of money may be charged when buying a battery, then it is later refunded upon returning the battery for recycling. When the price of lead in the market increases, demand for used car batteries also increases and encourages recycling. For used car batteries, most dealers or anyone collecting them for recycling will be willing to pay some cash. The lead metal from the battery can be completely recycled for the manufacturing of new batteries. The same applies to the battery container material. Other types of batteries that contain significant amounts of metals or materials that can be obtained for making new products can also be a source of cash. The industry increasingly finds it easier to depend on recycled materials like metals rather than having more mined. 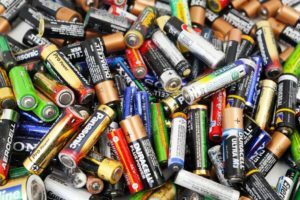 Even if you don’t get paid any cash for certain types of batteries that you help take to recycling facilities, preventing them from getting to the landfills is good enough. You definitely want to live in a clean environment free from the toxic materials contained in batteries. Do your part and support battery recycling programs for greener planet goals to be realized. Plastic is literally everywhere on our planet. It has become a vital part of our lives, which are mostly driven by convenience. However, that convenience comes at a price. Thanks to its resiliency, nearly every piece of plastic ever made still exists today. A very significant amount of it is thrown away and ends up in landfills, and sadly in the ocean. It is estimated that there are some five trillion pieces of plastic in the world’s oceans. By 2050, it is predicted that there will be more plastic, by weight, in the ocean than fish. Every year, around 8 million tons of plastic finds its way to the sea. In the U.S. alone, nearly 2.5 million plastic bottles are used every hour. It gets worse from there. All this plastic ends up swirling around in the ocean creating immensely large trash islands. One of the world’s largest is known as the Great Pacific Garbage Patch. While it’s difficult to get an actual size measurement, some estimates have it equal to the size of Texas, roughly 700,000 square kilometers. This area has one of the highest levels of plastic particulate caused by plastic degradation. Essentially, the plastic degrades and disintegrates into pieces so small that it becomes small enough to be ingested by aquatic organisms. It then becomes part of the food chain. There is actually growing evidence that fish may prefer eating plastic to food. There is also evidence that plastic is harmful to humans. Plastic’s main ingredient, styrene, is most likely a human carcinogen. There’s no evidence just yet that says the plastic that we eat in fish directly affects human health, but it is certainly getting there. Some of these plastic particles end up in the stomachs of marine animals like albatrosses and sea turtles. Many of the former lose approximately 1/3 of their chicks. Many of them die due to their eating plastic that is fed to them, when it is mistaken as food by their parents. It is estimated that every year, nearly five tons of debris gets fed to albatross chicks. Microscopic debris can also be eaten by jellyfish, which are then eaten by fish. It is a deathly cycle that doesn’t show signs of stopping anytime soon. With a life span of over 500 years, plastic isn’t going anywhere. In America, 50% of what gets put into the plastic recycling bin never gets recycled. It basically gets sorted and thrown out. And it won’t get better until it is federally mandated that every state should have a deposit system. Out of all the countries in the world, there are several that lead the way when it comes to plastic pollution. They include the Philippines, Vietnam, Sri Lanka, Indonesia, and China. The one thing that would help these countries is to stop the use of disposable products. Other solutions have included the use of floating Oceanscrapers, made from the plastic found in the Great Pacific Garbage Patch. All of this garbage that is out there floating in the oceans and killing animals and fish is an issue that should be on the front pages of media outlets everywhere. If we don’t pay attention to the canary in the coalmine, it could become a situation that is irreversible. As humans on this planet, we all need to unite on this issue so that future generations of humans and animals do not suffer dire consequences of our wasteful ways. When it comes to glass, the recycling loop is infinite. Glass can be recycled continually without loss in purity or quality. Now to clarify, we are talking about glass bottles and jars. Other kinds like Pyrex and windows are not manufactured through the same process. If these were introduced into the glass manufacturing process, they could cause defects and production problems. The approach of any recycling program is to create contaminant-free recycled glass. The way glass is sorted also makes a huge difference. So, make sure to separate your glass by color when you bring it down to a glass recycling center near you. The glass recycling loop consists of several steps. First, recyclables are placed in curbside bins, recycling containers, and/or brought to recycling drop-off locations where they are collected. They are then delivered to a material recovery facility and separated by their material types. From there it is sent to a glass processing company where it is separated from trash and sorted by color. Glass that is recycled is then sold to container manufacturers and formed into new jars and bottles. Finally, consumers buy beverages and food that come in glass packages. Glass is made from sand, soda ash, limestone and cullet, which is another name for furnace-ready recycled glass. The only material used more in glass manufacturing is sand. All these materials are mixed, and then heated to a temperature of 2600 to 2800 degrees Fahrenheit. Once it reaches the right temperature, it is molded into the desired shape. All this recycling helps to reduce emissions, and the depletion of raw materials. It also helps to extend the life of all the equipment used, like furnaces. And all around simply saves energy. Saving natural resources is an insanely important thing to try and accomplish; recycling glass lends a huge hand in that effort. In fact, for every ton of glass recycled, a ton of natural resources are saved. For every 10% of cullet used in the manufacturing process, energy costs are reduced by 2-3%. When it comes to carbon dioxide, for every 6 tons of recycled container glass used in the manufacturing process, 1 ton of carbon dioxide gets reduced. It really starts to add up, considering that fiberglass and containers industries buy 3 million tons of recycled glass every year, which is then melted and re-purposed for use in the production of fiberglass products and various original containers. There are roughly 46 glass manufacturing plants and 50+ glass processing plants where recycled glass is cleaned, sorted, and sold to manufacturing companies. As with aluminum, states that have container deposits enjoy a much higher rate of recycling, nearly three times the rate as that of states without deposits. Glass has followed aluminum in weight reduction as well, reducing by 40% over the past three decades, and is similar in having an incredibly large percentage (95%) of recycled material substituted for raw materials. Some 80% of glass is said to be recovered for recycling and use in the manufacturing of new glass containers. The process of glass recycling also creates many new jobs, so when you are finished with that bottle or jar, place it in the recycling bin and once you have a decent sized collection, bring it on down to your nearest glass recycling center. Who doesn’t have a bunch of aluminum cans lying around their house? Since their introduction to consumers in 1959, they have steadily grown to be the most sustainable drink container. You can quickly chill them, stack them, and hopefully, recycle them. Since they are the most recycled beverage holder, and contain around 70% recycled material, they are the most valuable item in your recycling bin. Merchandisers love them because they offer long-term preservation benefits. Aluminum cans create 100% protection against light, moisture and oxygen. They are packaging that is tamper-resistant, which helps to put the consumer’s mind at ease. Not only are foods and drinks packaged this way, but also paint and aerosol products. There are literally thousands of products that come in aluminum cans, and they should all be turned in to an aluminum recycling center near you! They are also becoming incredibly lightweight. Today’s average aluminum can weighs less then a half ounce. They don’t rust and can withstand pressures of up to 90 lbs. per share inch. The market continues to grow with the new energy drinks that usually come in 8 ounce cans. Many microbrew companies have switched to aluminum, as it offers a higher quality, since it doesn’t expose its contents to light or oxygen. The Coors Brewing Company is often credited with creating the first 12 ounce beer can, introducing it on January 22, 1959. And since then, the growth has been remarkable. Obviously, it has been spurred on by the popularity of soda products. The Coca-Cola Company was using cans around the same time. The world loves its soda and beer. Worldwide, roughly 200 billion cans are used every year. If you’re doing the math, that’s about 6,700 cans per second, which is enough to go around the planet every 17 hours. The energy to produce aluminum is more than any other precious metal on the planet; 2% of the world’s energy is used to produce it. It only takes roughly 5% of that allotted energy to produce aluminum from recycled aluminum. So, there really is no reason why you shouldn’t be recycling it. The scary truth is that Americans alone throw away nearly $1 billion worth of aluminum cans every year. Perhaps having one too many beers or sodas is the culprit! However, recycling cans seems to be on the rise. In 2013, 1.72 billion lbs. 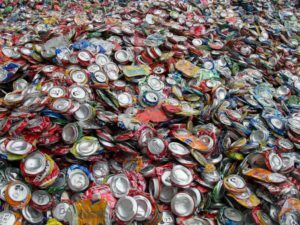 of used aluminum cans were recycled; that comes to about 60.2 billion cans. The energy that this saved could fuel more than a million cars for a full year. The ability to recycle over and over again, creates a high value for the material, as compared to packaging like glass and plastic. It’s known as a closed loop recycling process, and makes it economically and environmentally advantageous. So, if you’re sitting here reading this, sipping a cold one, or sucking down a Red Bull, when you’re finished with it, put it in your recycling container. If you don’t have one, it’s insanely easy to make one. Heck, just adding a bag under your kitchen sink is all it really takes. Then, when you’ve got enough of them, bring them down to your nearest aluminum can recycling center, and get some cash for them. Rinse. Recycle. Repeat. I work as Environmental Protection Officer. I work to ensure the proper disposal of waste materials. These materials can vary from simple office refuse all the way up to dangerous hazardous materials. I must ensure that every companies comply with government regulations on proper storage, handling and disposal of these materials. This includes identifying waste materials, training others on the proper safety guidelines to follow, and conducting risk assessments on hazardous materials. I typically evaluate and coordinate storage and handling of hazardous waste. They might lead efforts to clean up contaminated soil or water. They might also have to compile reports of safety performance for their departments and present them to higher level management.